Soundscapes/Landscapes is a site-specific collective project revolving around the exploration and the artistic re-interpretation of the Neos Kosmos neighbourhood in Athens. 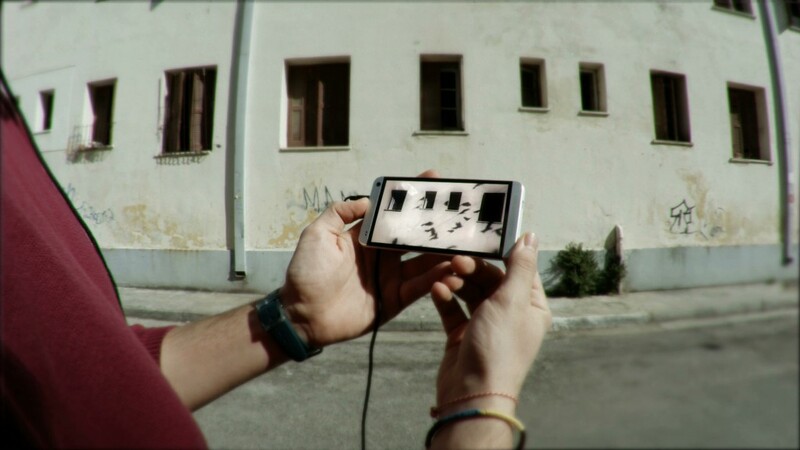 Drawing on audiovisual material from the various public and private spaces of the Neos Kosmos neighbourhood in Athens, as well as on the very people who live there, their history and their present, a digital rhizome has been created to augment and to transform the area into a hybrid and interactive urban installation. Visitors are invited to explore Neos Kosmos armed with a smartphone running an interactive digital map which will deliver them audio, video, texts and spoken word in real time and with respect to their geographical coordinates and the artists’ understanding of the area. Soundscapes/Landscapes features excerpts of poems and texts by: E. Kaknavatos, T. Kiaos, V. Mayakovski, M. Alexandropoulos, M. Papadopoulou, T. Patrikios, A. Poulos, Y. Seferis, Y. Skaribas, Y. Stigas, A. Gramsci, G. Agamben, K. Axelos, St Maximus the confessor, G. Deleuze & F. Guattari, Y. Kyriakidis, V. Novarina, T. Robins. Presented at Onassis Cultural Center, Athens, Greece during summer 2014.